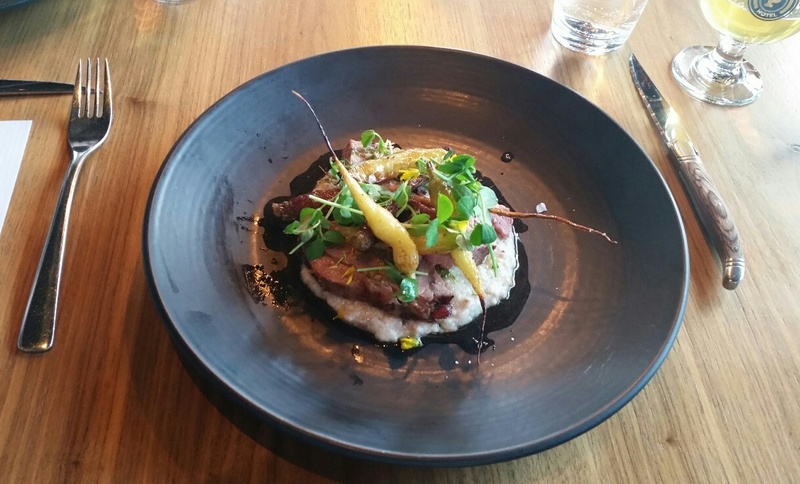 It was just recently…very recently, in fact…that I reviewed a special menu at UNION. But with the opportunity to attend a media dinner and sample their newest foray into food and beverage pairings, I thought it appropriate to let my readers know what’s in store. This time it was the first of what they plan will be monthly pairings for the restaurant, offering a set price for four courses, each with a beer from that month’s local brewery. This month’s featured brewery? Maine Beer Company. Starting with a pre-game Lunch – that’s one of the MBC beers – we whet our appetite for dinner. Once our first beers had been finished we received a pour of the – hold the capitalization – a tiny beautiful something. With a single, uniquely flavored hop, atbs carries a distinct flavor. 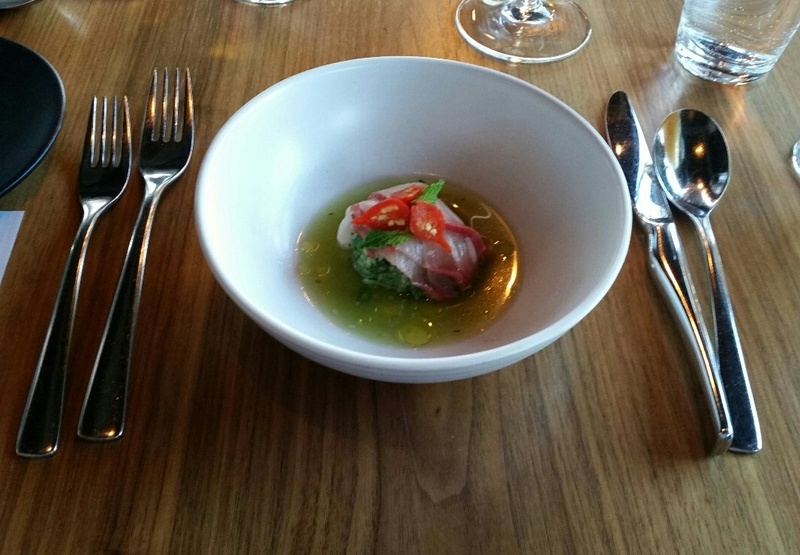 Within a few sips of that, we were given an app of Hamachi Crudo – olive oil, muddled cucumber, chili, mint. What stood out to me on the app were the cucumber and mint. Distracting me from the fact that I was eating raw fish, it provided a refreshing flavor that injected a little bit of cool summer breeze into my life. I might be getting used to uncooked seafood a bit after years of mostly avoiding it, but for now, I’ll attribute that the the excellent work of an accomplished chef. Our next pour was Another One. Born from an experiment that involved brewing a dark and a light beer with the same hops, this light, delicately flavored liquid was the survivor. Of note, at least one local bar won’t serve it, because “I’ll have another one” is too ambiguous of an order when a beer by that name is on the menu. With the AO, we were served some bread with sea salt and hop butter and then Braised Local Rabbit – house green curry, kaffir lime, sweet potato. The braised hopper was absolutely delicious with some some lemongrass, cilantro, and spice notes too. While the curry was nice, the transformative parts of the dish to me were the cilantro and lime. 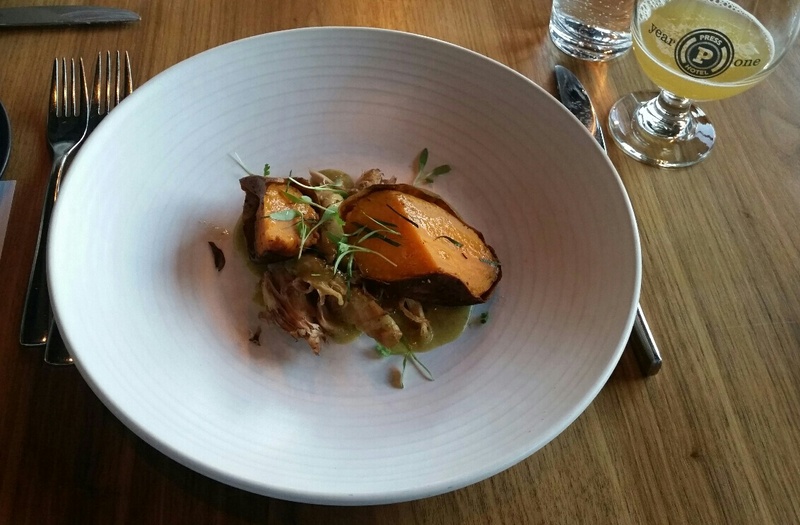 And if that seemed odd, it was even more strange that the lime went exceptionally well with the sweet potato. I couldn’t quite wrap my head around that combination, but it was utterly brilliant. The third dinner beer was Woods and Waters. Named for the Katahdin National Monument, we were “warned” of its piney hops which it turned out were indeed a reminder of the woods. With that beer came the most beautiful plate of the evening – Roast Local Leg of Lamb – barley porridge, hops and spruce gremolata, smoked carrots. Obtained from North Star Farm in Windham, the lamb was brined with beer and salt. The gremolata underneath added a little garlic and the porridge was just right. The carrots lit my mouth with the sweet smile of maple. The plate felt like a full meal unto itself, though it was sized appropriately for the circumstances. I finished it and was ready for final course. MO was the last beer of the night. Brewed to be right between the Peeper – their first beer – and Lunch, so as to be not too heavy or light, it was different than most final beer pairings which feature a thicker, heavier brew. 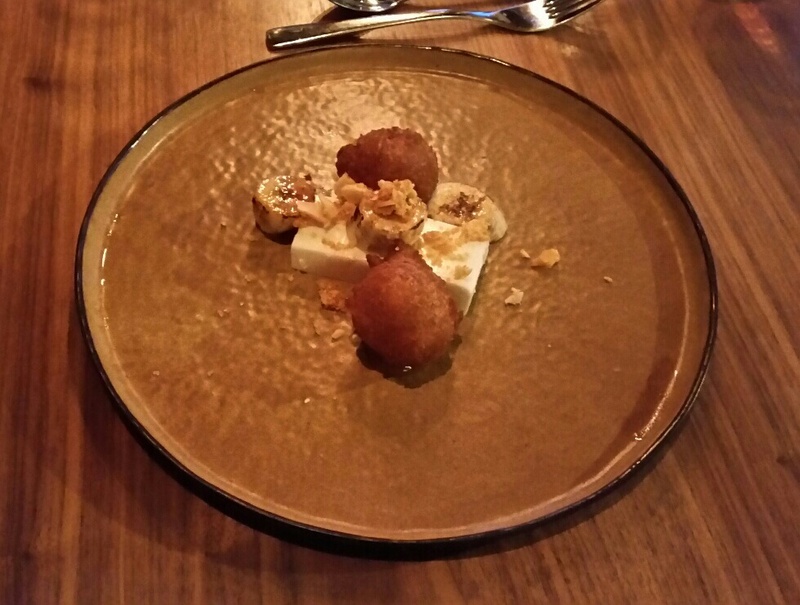 However, this one was intended to not fill up that last bit of space in the diner, therefore saving room for dessert which for this meal was Honey Panna Cotta – caramelized bananas, vanilla bean fritter, honeycomb, toasted macadamia. When the dessert came out, it didn’t look like much. It didn’t feel like I was looking at the love child of Gene Simmons and a proboscis monkey either, but it just didn’t have the beautiful colors the other plates had. That didn’t matter to me as I tried the panna cotta with some banana and nuts. It was good and I figured I’d follow that up with one of the two fritters. Those stopped me dead in my tracks. The fritters were undoubtedly the best I ever had with the fry-iest, most decadent, texture and rich, doughnut-like flavor. What a creation! After I stopped reeling from the power of the fritter, I was able to eat the rest of my food including the second fried ball of battered divinity. It was a great cap to a meal that featured foods from the light to the hearty. A little bit of rich sweetness provided just what I wanted in a final course and as I wrapped up, I felt like I had accomplished something, eating a meal that had so many pleasant flavors. I really liked what UNION did with this meal. First of all, they put out some awesome food. Regardless of whether you order from the menu or eat a prix fixe meal, you’re sure to get something great. But the pairing with a top shelf local brewery is a long overdue endeavor. More restaurants should be doing this. As the craft beer explosion continues and Maine nears 100 breweries – yes, we’re almost there – restauraunts will only benefit from working with them. Congratulations to UNION and Maine Beer Company for both putting out great product. To reserve your spot at the “Dinner with Maine Beer Company”, call 207-808-8700. Seating times are every future Wednesday in May at 6:00 pm. Tell them Peterpeterportlandeater sent you and let me know what you think. This entry was posted in Portland, ME food on May 8, 2017 by peterpeterportlandeater.